On July 4th, one of my relatives brought a tasty Asian-inspired salad with noodles. A couple days later it occurred to me that the noodles were probably soba noodles, which I’ve seen in Asian dishes around the web. Soba noodles, I learned, are made of buckwheat flour and wheat flour. They contain all eight essential amino acids, along with antioxidants and other nutrients (source). As a long-time fan of using whole wheat pasta in Italian dishes, I was sold on the idea of Asian whole wheat noodles. I found some for about two dollars at a local gourmet store. 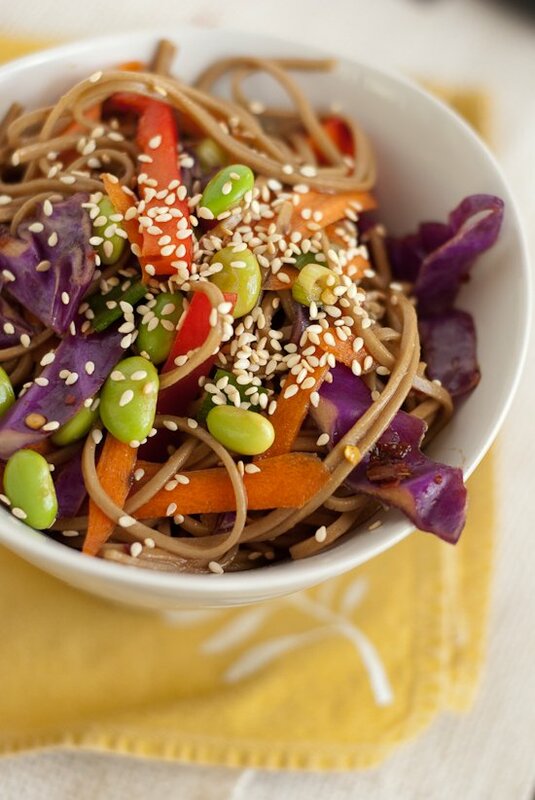 I was torn between this recipe from Aggie’s Kitchen and the peanut soba noodle bowls on Eat, Live, Run. Aggie’s won because it called for shelled edamame instead of tofu, which meant less cooking for me. In this 100+ degree heat, the most I can do is boil water for pasta or quinoa. I upped the amount of vegetables in Aggie’s recipe and added extra cilantro, because I love the stuff. Intrigued by Eat, Live, Run‘s idea of adding peanut butter to the noodles, I tried it with leftovers—and woah. It’s incredible. No matter how you eat this salad—cold, reheated, or warm with a dollop of peanut butter—you’re going to love it. 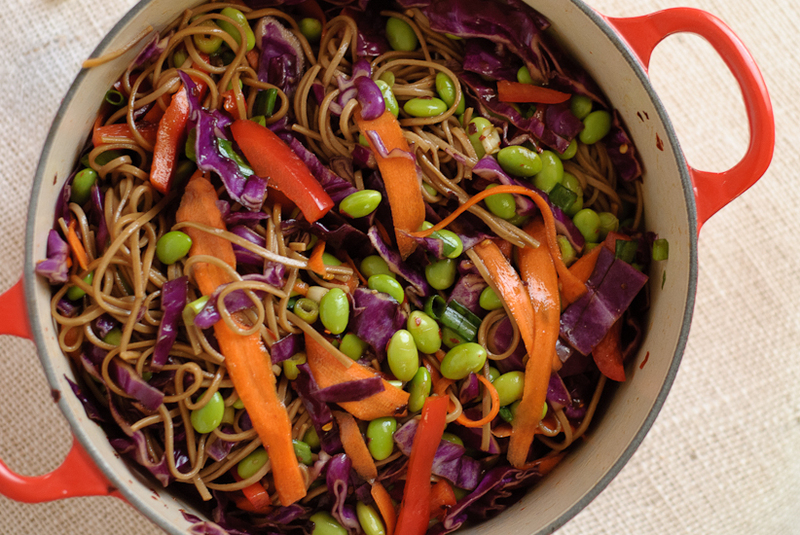 This vegetarian soba noodles recipe is a colorful, healthy, delicious meal! It’s super easy to prepare, too. Just cook the noodles and toss in the rest! Cook soba noodles according to directions, and rinse in a colander. 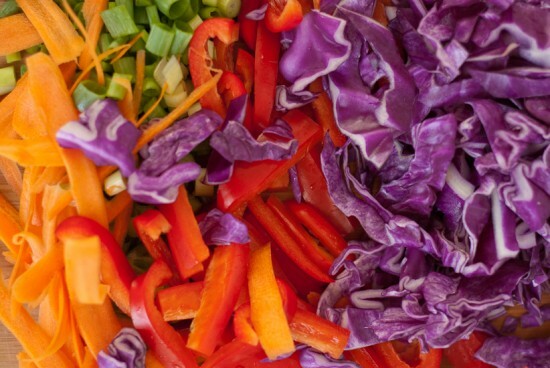 Chop up all your vegetables, and toss into a bowl with the soba noodles. 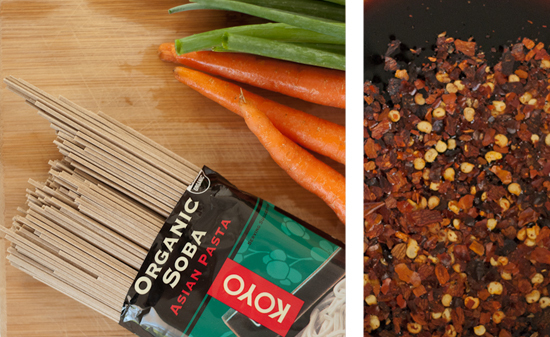 In a small bowl, whisk together the tamari, sesame oil, other oil, rice wine vinegar and red pepper flakes. Pour the dressing into the pasta and veggies and toss well to combine. Enjoy! Make it gluten free: If you are sensitive to gluten, seek out 100% buckwheat soba noodles or substitute your favorite gluten-free spaghetti. That looks so good! I love the bright colors. And I love soba noodles and I’m always looking for new ways to try them, so this is perfect. I love using all the veggies in this. I’m going to try this for sure, peanut butter sounds like an awesome option! Hooray, please let me know how it turns out! I have a hunch that you could toss peanut butter with the warm, cooked soba noodles if you want to incorporate it with the whole batch. So lovely . . . We just had it for lunch. I used everything, added basil and substituted peanut butter for almond butter and made more dressing than required… Delicious!! I always love colourful dishes and this looks great! This looks AMAZING! I’ll have to try this out for my boyfriend, he’s a bit of a soba junkie. I’m a bit of a soba junkie after trying this recipe. I went back to the gourmet store and stocked up on noodles. Can’t wait to try more variations! I don’t know if it’s okay to make requests. But if you could come up with a recipe that requires the use of several HUGE cucumbers, that would be awesome. It’s the only thing my garden is producing out the wazoo. I’ve made cucumber water, quick pickles, and we’ve had cucumber on every salad since the start of June! Maybe you could start an “Ask Kate” portion of the blog? Hehe. But seriously. I love that idea! I have some cucumber recipes up my sleeve for you, but I probably won’t be able to make them until next week. I’m going to Denver on Thursday, and hanging out with Kirsten Thursday through Saturday! This salad sounds lovely! Great combo of flavours. Yum! Just made the recipe tonight. It was easy, fresh and super healthy. Added chicken breast on top. Super tasty! I’m so glad to hear you enjoyed the recipe! It is super healthy, and even more filling with chicken, I bet. Go for it! This recipe is really easy. All you have to do is cook the pasta, chop the vegetables, and throw it all together! This salad looks so great and refreshing! I think I can handle turning on the oven just long enough to cook those noodles. 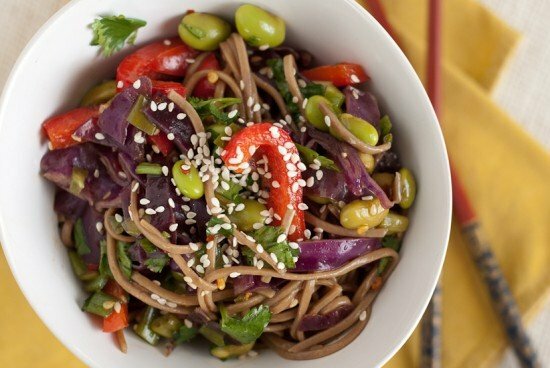 ive been having soba a lot lately as well…i use tahini + soy sauce instead of PB though. will try the PB version next time! I never would have thought to add tahini! I’m going to try that soon. Gorgeous, gorgeous salad! With the heat of summer settling in, I’ve been craving salads much more than usual–and this one looks and sounds perfect. I’m in love with these photos. YUM!! Can’t wait to try it; soba noodles are our favorite. The jalapeño and lime sound so dream, too. 8 or 8 oz soba noodles? Thanks for the pb idea! Sorry, 8 ounces! That’s a full package of noodles. Made this tonight. Delicious!!!! I added steamed kale and it complemented the flavors really well. Psyched I have leftovers for tomorrow’s lunch. Yum! Made this for dinner tonight but I stir fried the veggies (except the onions) and added a tablespoon of Tahini to the sauce. I wanted a hot meal. It was great! My husbands favorite so far, my little guy loved it too! I can’t wait for lunch tomorrow for some leftovers lol. Kate, I will make this recipe the first one I try with Soba noodles! I don’t know if 1/2 c. tamari sauce means reduced TO or reduced FROM 1/2 cup. Can you help please? THANK YOU. Hi BarbaraAnn, I’m sorry for the confusion. The recipe calls for 1/2 cup of tamari sauce. I recommend using reduced sodium tamari sauce to cut down on the saltiness of the dish. I’ve been meaning to make this salad for weeks and finally did so tonight. I am on my third bowl of it! Absolutely delicious and beautiful to look at. I did add the juice from half a lime, 1 T. peanut butter and half a seeded jalapeno. It definitely has heat, but in a good way. I think that my kids would have preferred it without the jalapeno and maybe reduced the red pepper flakes. The only thing I did wrong was use regular tamari instead of reduced sodium and the dish did turn out a tad too salty. I’m so glad you enjoyed the soba noodle bowls, Tonya! Regular soy sauce/tamari can be way too salty, but I’m glad it still turned out ok! Any idea how long leftovers of this salad keep in the fridge? I wanted to make ahead for lunch for the week but wanted to know if you knew how long I could save it for, and if I should keep the dressing on the side for now or if it’s okay to throw in ahead of time. Hey Alex, great question! I mixed up this salad all at once and enjoyed the leftovers for several days without problems. 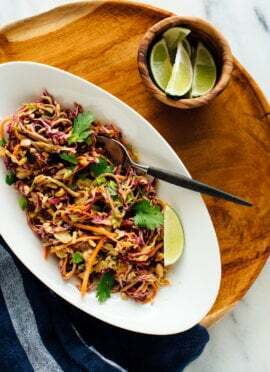 The only ingredient here that will wilt in the dressing is the cilantro, so you might want to keep that separate and add it to each bowl before you’re ready to eat. Otherwise, I think you will be all good! The tamari should act as a bit of a preservative so I would think that this salad will last for 4 to 5 days in the fridge (maybe longer, I trust your judgment here). This is a great recipe, although I couldn’t make the dressing work as is; the 1/2 cup of tamari was too much for me. Instead, I made the dressing with 1 T of tamari and that did the trick. This recipe is going into my rotation. I’m a little late to the party, but this is a keeper! I added jalapeño and used fresh veggies and it was perfect. Now on to more of Kate’s tasty recipes :) go Kate! I made this today – very good – thanks for the inspiration. I made it with what I had in the house, so used fresh parsley rather than cilantro and I had no edamame so there were no beans and I had no spring onions but a ton of chives so threw in a bunch of those. I also used tahini rather than peanut butter. I think you could make it 2 flavor styles – one more Thai inspired with peanut butter and crushed peanuts instead of sesame seeds, using also lime and cilantro. And one more Japanese with the sesame seeds,and use tahini to keep the sesame flavor theme going. I think it would also be good for the Japanese-y style with some fresh chopped ginger or little Japanese pickled vegetables … next time ! Fantastic suggestions, GN! Glad you enjoyed it. This was a HUGE hit at my birhday bbq yesterday. We had Thai inspired smoked ribs with a pineapple/vinegar/fish sauce dipping sauce and marinated skirt steaks and this salad was a perfect counterpoint. Thanks for a wonderful, delicious and healthy recipe! Happy to hear that you enjoyed the salad, Tess! Sounds like it complemented the rest of your meal nicely. What a wonderful recipe!! 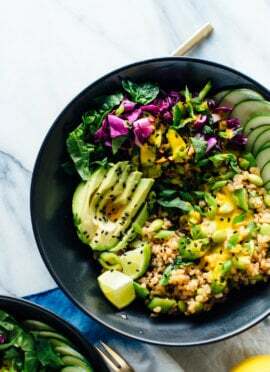 Easy, delish, healthy and beautiful ! Can’t wait to have my friends over to serve this dish. So glad I came across your site! Thank you ! Thanks, Aubree! I’m so glad you two enjoyed it. I can’t blame your boyfriend, I lose all control in front of a bowl of soba noodles myself. I am so exited to have found this….looks amazing! Question – do you use seasoned rice vinegar? Or just rice vinegar? Thanks!! Thanks, Keri! I used regular, unseasoned rice vinegar. Be sure to use reduced sodium tamari/soy sauce… the regular stuff is too salty. This is one of my favorite dishes of all time, and is now a staple in our house since I found it about a year ago. Even my 10 year old likes it!! Just saw your brussell sprout & peanut soba noodle slaw recipes. Can’t wait to try them out! I made this salad 2 years and a day ago for my first Sunday dinner with friends in college. It was delicious and a huge hit (a couple friends found it too spicy, an easy fix for them.) I decided to make it again tonight (adding baby corn!) with hopes of having it for lunch each day this week. Well, I forgot just HOW much this makes. I’ll have to get eating :) Thanks for an awesome recipe, and one I’ll keep coming back to for sure! Thanks, Minna! Glad you enjoyed the recipe! I bet sugar snap peas were great. I’m making this for the millionth time upon request from my eldest. Such a good way to get vegetable matter into the kids. It’s also my go to summer potluck share, so Thank You for the recipe! Yay, happy to hear your kids are enjoying this veggie pasta! Thanks, Krista! So delicious! I made this dish last night. I added fresh basil, garlic and ginger. The peanut butter addition for lunch today was even better. Thank you! Thank you, Jackie! Really glad to hear it! This dish is fantastic (coming from a soba-holic)! We added a tablespoon of tahini that thickened the sauce and added extra flavor. Highly recommend. Thank you! Maddie, I’m sorry I didn’t see your question sooner! I’d say it will keep well for up to four days. Thank you, Emilie! Your version sounds awesome. I love love love your recipes! I make them several times a week. I’m looking for hot recipes now, for the cold weather. Thanks so much! Seems like the ingredients section has disappeared! Jodi, thank you for bringing that to my attention! I really appreciate it. It’s fixed now. I recently made some changes in how my recipes display and somehow a few of them lost their ingredients or instructions along the way. Oh, I’m so glad it worked out with frozen veggies, too! Great that you loved it, Lydia. Thanks. So colorful and delicious! You know it’s good for you with all that color! I used zero noodles and added some black beans for a little more protein and made it a dinner. Yum. Yum! That sounds delicious, Jennifer. Thanks! Wow, this is seriously delicious! The sauce to veggies and noodle ratio is perfect and it has so much flavor! I’ve been trying to find a great recipe to take with me on my trips (Flight Attendant here), and this is perfect. Thanks Kate! This is the first comment on a recipe that I’ve ever made because I wanted to thank you! I came across this about 1.5 years ago, scrolling through the internet. 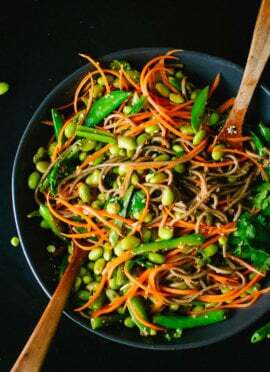 I never had cooked with soba noodles before, and this recipe, along with the sugar snap peas & carrots recipe, kick started a love of soba noodles. I’ve used both these receipes as the basis for countless meals. Thank you! Well thank you for taking the time to comment, Skye! I’m so glad you enjoy this dish so much! I noticed that canola oil is not listed as one of the ingredients for this dish, but it is in the instructions (step 3). Could you clarify whether or not it is one of the ingredients? Sorry about that, Alex. Canola was originally an option listed in the ingredients list but I don’t like to recommend it any more. You can use peanut oil or olive oil. My new favorite salad. I love soba noodles and adding all these fresh veggies made it a meal.Need to invest a little time in prepping the veggies but very simple to put together. I made just half the recipe and still had plenty for 2 more meals. Outstanding. Would be great to take to picnics too. Wonderful, Denise! Thank you, for your review. This was so delicious – not to mention quick and easy. We made a batch to bring to the beach – Yum! Once again a super successful recipe! Colorful, highly adaptable to whatever vegetables are available at the moment, and I just can’t get enough of that sesame soy taste! This recipe has become a favourite in my house and one that is requested quite often. Love the freshness of the veggies and flavours of the sauce. Tastes even better the next day! Wonderful, Kloe! Thanks for the review.